For the past three years, I have been following the restoration work of the memorial to those from Oberursel who died in the First World War: The Ehrenmal. The war memorial, which stands next to the Christuskirche at the crossing of the Oberhöchstadter Straße and the Füllerstraße, was badly in need of restoration when the Hessentag took place in the town, but now, thanks to the donations of not only the town itself but many private families, once again is glittering in the evening sunset. 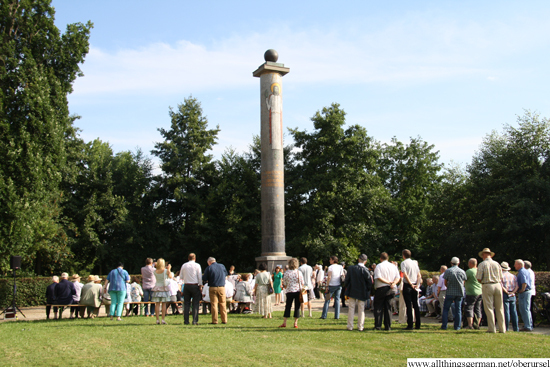 With the mosaic pieces returned to the column and the column itself now stabilised, it was a solumn ceremony that took place on Wednesday, 23rd July, 2014 to commemorate the war dead and officialy re-dedicate the memorial. Today, 17th November, 2013 is “Volkstrauertag” in Germany. Remembrance day. And this time last year I wrote about the progress being made on the war memorial in Oberursel for those who served and died in the First World War. 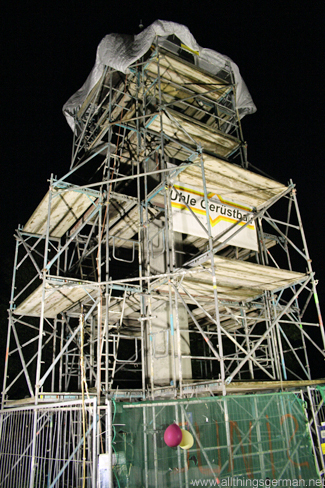 I had hoped to post a photo of the restored monument, the “Ehrenmal”. But although work has progressed since last year, the project is still to be completed.